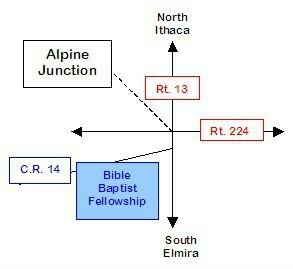 Directions to: Bible Baptist Fellowship Church is located at 5950 County Route 14, Alpine, NY 14805. Travel south on State Route 13 approximately 12 miles to the traffic light at Alpine Junction*. Take the next right hand turn. This is County Route 14, and the church is immediately on the left. ravel north on State Route 13 approximately 12 miles to County Route 14. Turn left on County Route 14 just before the traffic light at Alpine Junction*. The church is immediately on the left. Travel south on State Route 14 to Mountour Falls. Turn left onto Route 224 to the traffic light at Alpine Junction*. Turn right on State Route 13. Take the next right hand turn. This is County Route 14, and the church is immediately on the left. *Alpine Junction is the intersection of State Route 13 and State Route 224.